That epithet Tolsimir carries this time around is not just to make him seem more imposing and give us insight into who he is: it’s a hint that he’s not just a powerful card for the smaller formats. You already get quite a good deal if you play him in a “straight” green-white deck – six power, three life, and one fight trigger is a lot for his mana cost. But he interacts with a tribe that goes all the way back to Alpha and forward into an unknown future (basically any plane that has a vaguely European-style aesthetic is likely to have wolves! ), in colors that have no trouble generating creatures and sometimes need a little extra help with removal, and in a manner that goes well with abilities like lifelink. Some of the Ixalan block’s green dinosaurs might have more relevant abilities against the current Standard field’s blue decks, but he has potential for future Standard and especially for long-term casual use. War of the Spark is bringing out all the old names, isn’t it? Ravnica: City of Guilds brought us Tolsimir Wolfblood, an elf that brought a Wolf friend. Now he’s back, bringing another Wolf friend (still named Voja, though naturally bigger). 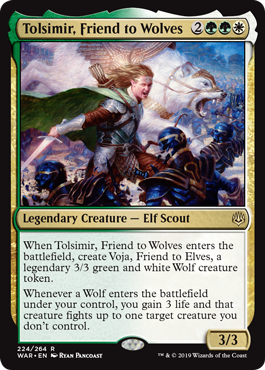 Interestingly, Tolsimir tries to be a bit of a Wolf tribal commander, thanks to the effect of having your Wolves go for the throat when they come into play. Just at rate, Tolsimir 2.0 brings you 6/6 in stats for 5 mana, plus 3 life and the ability to spot remove a creature…not bad. Neither body is very large, but splitting it up makes it resilient to some removal. And, hilariously, this Tolsimir plays well with its forebear. I don’t think he’ll be a Constructed all-star, but he brings a lot of value immediately and has the ability to accrue value in longer games.